Your child’s program aligns with the Pennsylvania Department of Education’s Core Content Standards. These standards spell out what children in Pennsylvania must learn in English, language arts and math at each grade level including kindergarten and pre-kindergarten. 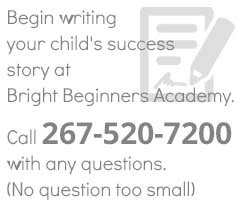 Prepare your extraordinary child to succeed in any Pennsylvania kindergarten.